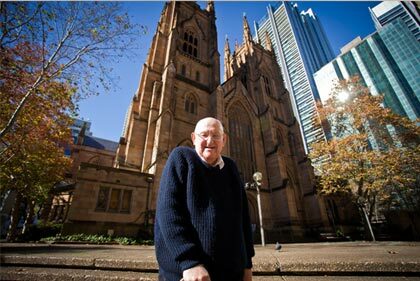 A leading Australian evangelist for more than 50 years, John Chapman was best known for his relentless passion for spreading the gospel of Jesus Christ. Affectionately known as ‘Chappo’, his wide preaching, teaching and writing ministry saw him speaking to groups throughout the Sydney Diocese, in Australia and overseas, particularly in London, where he was a regular visitor. He spoke and preached at Oxford and Cambridge Universities and also played a major role in Billy Graham crusades. In later years, he passed on his wisdom on evangelism and preaching to generations of ministry trainees and college students. He was also prominent in evangelism in universities, particularly during the 1970's and 80's. His books, including "A Fresh Start" and "Know and Tell the Gospel" have sold in the tens of thousands and continues to be great resources for personal evangelism and sharing the gospel. Beginning his career as a school teacher, John later pursued theological training and spent over 25 years as Director of the Anglican Department of Evangelism in Sydney (now known as Evangelism and New Churches). The ministry expanded under his leadership from the 1970s to the 1990s and now enjoys a far-reaching impact throughout Sydney and Australia. When asked why supporters should be encouraged to leave a legacy to the John Chapman Foundation today, he said it’s all about his vision and passion for evangelism. “I’m passionate about telling people about Jesus. About our investing all that it takes to bring the world the truth it’s so desperately searching for today. If we keep quiet, who’s going to tell them? One less person to evangelise is one less person who could know Jesus and be saved. How wonderful it would be in heaven, to meet people who are there, all because we had invested in evangelists who were able to make an impact in their lives. Just think about that! Through the generosity of God’s people, I was personally able to spend 25 years of my life evangelising. It freed me to preach the gospel and train others day and night. And I thank God for that”.